Easter Sunday is the biggest celebration in the Christian community. But what’s the big deal? Is the resurrection of Jesus anything more than a pie-in-the-sky-for-something-after-you-die fantasy? Or could the risen life of Jesus actually make a difference in the here and now? In my life and yours? What if Jesus actually wants to bring new life on earth just as in heaven? 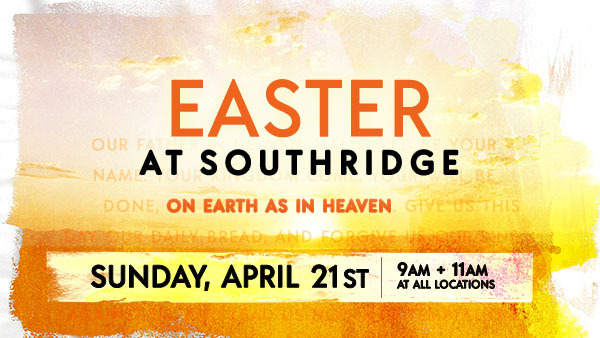 We invite you to Easter at Southridge as we share stories, celebrate baptism, and lean into the resurrection power of Jesus. Invite your friends, family, neighbours, co-workers, and classmates – all are welcome. If you’ve ever longed for “heaven on earth”, we believe Jesus wants to meet you right where you’re at. We will be meeting at 9:00am and 11:00am across all three locations.